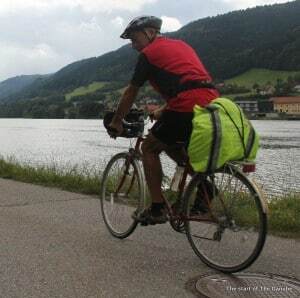 Another excellent days biking and 64 miles on the clock, making it 719km cycled along The Danube in the first week. I make that 25% of the total Danube distance. Today was a terrific day apart from the last 7km, maybe it would have been better to cross onto the right bank over the locks at Hagenau. Prior to this the route was spectacular on smooth quiet paths tightly following the Danube as it wound its way through heavily wooded gorges. You have to use 3 little ferry services, but they add to the fun. Definitely a recommended cycling day. Tonight I’m at Hotel Mühlviertlerhof (warning: music starts up!) in the centre of Linz, yet another excellent find by the Around Me app. I love that these places start serving breakfast from 06.15, South West coast path accommodation take note! Dinner after much searching was at the really excellent Mia Cara Italian place. In facr today has been an excellent foodie day with the exquisite breakfast at Anton in Passau followed by coffee & cake at Jochenstein, then my fish & beer at Martins Rauchkuchl. for lunch.